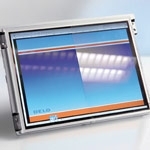 DELO Industrial Adhesives presents new adhesives for bonding industrial displays and touch panels. Typical application areas include large-area displays in industrial applications, the automotive industry and aircraft interiors. The new optically transparent adhesives improve the readability of displays in direct sunlight and increase the ruggedness. Disturbing reflections from the surroundings are significantly reduced by bonding the glass cover directly to the LCD using an index-matched adhesive. The new adhesives combine extreme softness and high optical transparency with good adhesion and yellowing resistance. For the first time, the developers succeeded in unifying these properties in a completely new chemistry that allows curing of shadowed areas. The displays are processed fast in short cycle times with the help of light curing. Afterwards, the adhesive completely cures through a reaction with air humidity. That means for the customer that the components postcure at room temperature and no further curing step is necessary. When bonding the components, the display is more durable and the resistance to vibrations and shocks is increased. GE announced the IVD2010 and IVD2015 Rugged Intelligent Vehicle Displays, designed for deployment in harsh environments.